Looking for a place for your horses, chickens or pigs? This is the place!!! 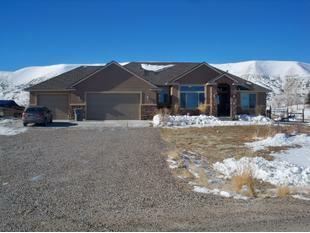 This custom built ranch style home was built by Montgomery Construction. The main floor has open entry, living room, dining and kitchen with breakfast bar. It also includes master suite on one end and 2 bedrooms with full bath on the other end and an extra multi-purpose room. The basement has large family room with wet bar, 3 more bedrooms (one with a large walk-in closet) and a full bath. There is also an extra room for crafts, reloading, etc. Plus storage, storage and more storage. The home is located on 2.01 acre corner lot. Landscaped front and back with 230 trees on a drip system. There is also a barn with loft and 6 corral panels. Six raised garden beds on drip system, too. Outdoor storage shed. Plenty of RV parking. Certified metal window well covers. Split 200 amp service. Road maintained by the county. The school bus picks up right at the neighbors. So many more amenities. Call Becky Costantino for your personal showing or for any questions you may have.